The financial performance of power utilities remained subdued in the March quarter. Overall power generation is up just 3.4%. Comparatively, generation at India’s largest producer NTPC Ltd increased 2.8%. Utilization at thermal power plants softened. Further, a high wage bill and an impairment charge means the reported profit dropped 25% from a year ago. Even excluding the impact of one-off items, profit growth is subdued at less than 4%. An adverse compensatory tariff order affected Tata Power Co. Ltd and Adani Power Ltd. Adani Power slumped deep into losses as the firm was forced to write off the revenue it had been booking for cost under-recoveries at its Mundra plant. 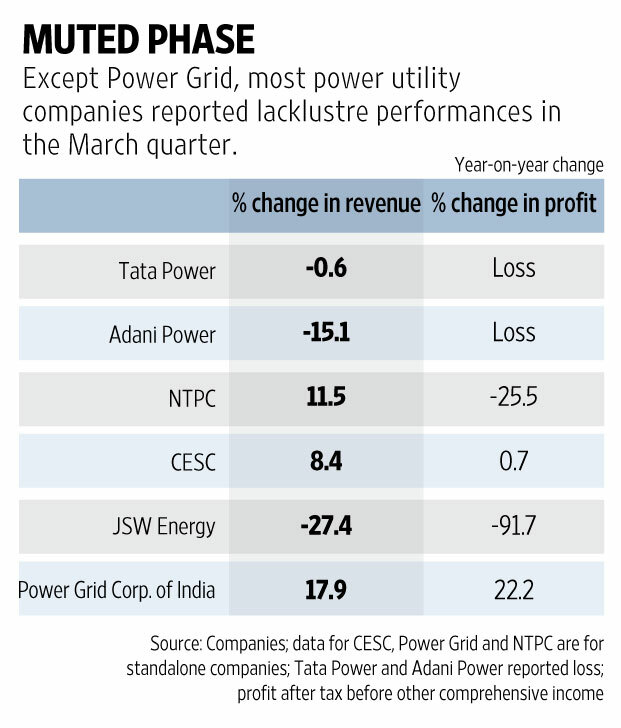 As a prudent measure, Tata Power was not booking compensatory revenue in its financial results. Even then, the firm slipped into a loss in the March quarter, as it had to write off its share of contractual obligations extended to Tata Docomo Ltd. Performance at CESC Ltd also remained subdued, though the March quarter results were overpowered by the company’s restructuring plan. JSW Energy Ltd, on the other hand, reported a sharp drop in revenue and profit as weak demand and lack of sufficient electricity buyers hit the company’s performance. In comparison, Power Grid Corp. of India Ltd, which builds and manages power transmission networks, delivered a better performance. Capitalization, or project additions, remained strong. With the company incurring record capital expenditure in the previous fiscal year, analysts expect the firm to report a strong performance in the current fiscal also. Expectations are also high on NTPC. The firm plans to add about 5,400 megawatts of capacity this fiscal. As the capacities come on stream, NTPC’s earnings are expected to get a boost. Overall, despite subdued demand, prospects remain encouraging for public sector utilities (Power Grid and NTPC), thanks to their regulated nature of business and strong capacity additions pipeline. Management commentaries indicate payments from power distribution companies (discoms) improved post the implementation of discoms revival scheme Uday. As discoms’ financial situation improves, they expect demand to see gradual recovery. Till then, firms that have free capacities will have to make good with the short-term contracts. “There is no visibility on long-term PPAs (power purchase agreements); however, companies are evaluating opportunities in the short and medium-term contracts,” Motilal Oswal Securities Ltd said in a note.